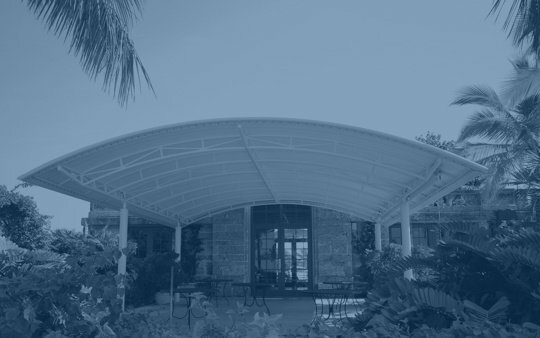 The Miami Awning Company has been in business since 1929, and has used Herculite fabrics throughout the years for both residential and commercial projects. When they were hired by Lynn University for a large-scale project, Miami Awning had no question where to turn for their fabric needs due to the long-standing, successful relationship with Herculite. Lynn University contracted Miami Awning Company to build two 66'-2”x15'-3” canopies for the Bobby Campbell Soccer Stadium that were to cover the stands. The previous canopies at the stadium were in desperate need of an upgrade. The university had two simple, fold-up mesh-type covers. Lynn University wanted the old canopies replaced with a canopy structure featuring a more modern design, colors matching the school’s colors, and that would ultimately provide improved shading and weather protection for spectators. Miami Awning Company chose Herculite's Coastline Plus product line, in ocean blue. It was a perfect fit with Lynn University's school color. As well as matching the colors, the Coastline Plus line is fire-retardant, water resistant, and fits tightly onto the frame. Miami Awning used 120 yards of the fade, dirt, age, and mildew-resistant Herculite fabric to construct the desired canopies. The old mesh canopies were removed, and the dual canopy structure with matching colors was built to order. Lynn University could not have been happier with the results. Lynn University officials were pleased with the contemporary look of the new canopies. Thanks to the Herculite Coastline Plus fabric, more than 500 spectators can now take in the many events Lynn University sponsors, while being protected from the rain and harmful UV rays alike. Herculite's versatility and wide selection of quality fabrics played a key factor in Miami Awning Company's success. “We have enjoyed working with Herculite and will continue offering their fabrics to our clients. I would also highly recommend them to others,” said Martin. Interested in learning more about Herculite's Coastline Plus awning fabric? Fill out this form to request a quote or fabric sample, or call us directly at 800-772-0036. - Anita Martin, Miami Awning Design Coordinator.